She’s been tapped to write the reflections for the Way of the Cross that Pope Francis will lead in Rome’s Colosseum on Good Friday, usually attended by tens of thousands and followed on TV by millions. 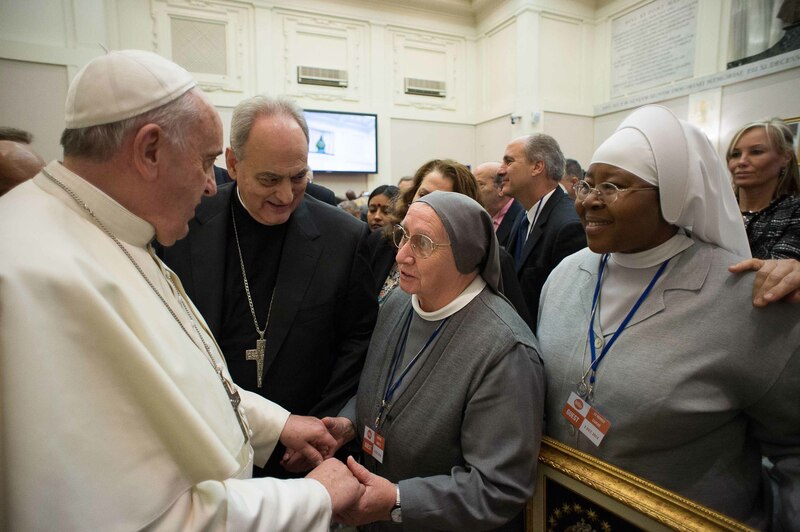 Each year, the pope asks a different person to write the commentary and prayers, and Sister Eugenia is not expected to go “soft” as she’s not one to mince words. Sister Eugenia is a leader among religious women working against human trafficking. She started and led anti-trafficking initiatives for the Italian Union of Major Superiors and helped educate officials in Italy and the United States about the problem. Human trafficking is often described as a hidden crime, making it hard to quantify. However, it’s considered to be the third most profitable illegal industry, behind arms dealing and drug trafficking. It affects between 20 to 40 million people around the world forced to work in slave-like conditions in prostitution and child labor, or who become victims of organ trafficking. It’s estimated to generate $150 billion in annual profits. Numbers aside, Pope Francis has seen the fight against this illegal industry, a “crime against humanity,” as a core social concern of his pontificate. Prior to that, it was a priority for then-Cardinal Jorge Mario Bergoglio, who fought modern-day slavery in Buenos Aires. An upcoming conference on “Pastoral orientations on Human Trafficking,” organized by the Migrants and Refugee section of the Vatican’s Dicastery for Integral Human Development, which answers directly to the pope, gives a wide meaning to modern-day slavery and shows just how widespread the problem is. Topics at the April 8-11 conference include the situation of construction workers, domestic workers, the maritime industry, modern technology industries, agriculture, supply chains, the business connection, special vulnerability of women, children and adolescents. The conference will also look into forced marriage, servitude, forced begging and organ-harvesting, and the connection between slavery and the ongoing migrant crisis. Among other signs of Pope Francis’ commitment, in 2014 he summoned Anglican, Orthodox, Hindu, Buddhist, Jewish, and Muslim leaders to sign a joint declaration against modern slavery in the sense of human trafficking, forced labor, prostitution, and organ trafficking, declaring it a crime against humanity. During a youth symposium against modern slavery organized at the Vatican that same year, the pope called for a hands-on approach. In 2015, Pope Francis instituted the World Day of Prayer and Reflection against Human Trafficking, marked Feb. 8. The date is the feast of St. Josephine Bakhita, considered a patron for trafficking victims. Born in 1868 in Darfur, Sudan, she was kidnapped at the age of nine and sold into slavery, first in her country and later in Italy. She died in 1947 and was declared a saint by Pope St. John Paul II in 2000. On Pope John Paul’s watch the Santa Marta Group was born, a coalition between nuns and the police launched in the United Kingdom with the support of Cardinal Vincent Nichols, which has since become a global brand. As archbishop of Buenos Aires, Bergoglio sponsored an NGO called “La Alameda” that fed him information about slave labor in Argentina’s clandestine sewing shops and also human trafficking for prostitution. The future pope would find work and asylum for survivors.